GPD supports organizations to design, build, and operate Program Management Organizations (PMOs). A PMO establishes common governance, process, and practice across a portfolio of projects and, if successful, significantly improves cost-time performance. However, a PMO requires more than common processes and tight-fisted control. A PMO will fail if it doesn't address several key dilemmas that are very common in traditional project management. Mismatch of centralized control and dynamic needs. Ineffective PMOs push process down to projects without adaptation and reciprocity. Gaps between generic standard work and project-unique requirements create friction. The detail data & dashboard trap. IT automation emphasizes data over human activity & attention. Detail required to feed the PMO can diminish effective learning, strategic decision-making, and adaptive performance. High-level dashboards give false views when relying on untimely reports and poor quality analyses. PMO inflexibility to a range of cultures. Cultural norms for targets, decisions, communication, and quality vary by organization and region. In order for the PMO to be adopted and information meaningful, the practices must be tuned and flexible. Misalignment leads to duplicate entry, waste, and an inaccurate PMO view. Sustainable response to change and optimal learning become common practices in pockets across a portfolio, handled by capacity-limited teams with timely feedback and change control. Flexibility is promoted through practices to monitor and respond to progress, dependence, and risk as projects unfold. For projects, engagement with the PMO is worthwhile: they get more insight than they give. Information and response cycles are aligned to where knowledge is owned, has value, and requires action. The PMO coordinates and prioritizes without micro-control. The shared focus at key interfaces is on cross-project priorities, shared resources, and dependencies. A functional dialogue triggers project level feasible and valuable adjustments. Detail is kept to appropriate levels, accountable to whom it makes sense. Knowledge becomes more likely to be complete, timely, and accurate. 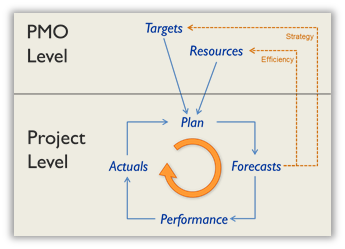 Project Design accelerates application of PMO standards yet allows them to be tailored to each complex project. The organization moves to higher levels of project maturity (PMM).